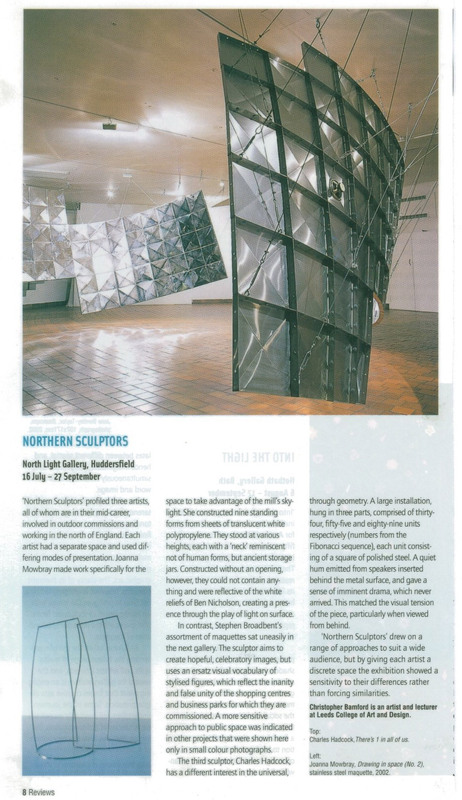 Article Text: ‘Northern Sculptors’ profiled three artists, all of whom are in their mid-career, involved in outdoor commissions and working in the north of England. Each artist had a separate space and used differing modes of presentation. Joanna Mowbray made work specifically for the space to take advantage of the mill’s skylight. She constructed nine standing forms from sheets of translucent white polypropylene. They stood at various heights, each with a ‘neck’ reminiscent not of human forms, but ancient storage jars. Constructed without an opening, however, they could not contain anything and were reflective of the white reliefs of Ben Nicholson, creating a presence through the play of light on surface. In contrast, Stephen Broadbent’s assortment of maquettes sat uneasily in the next gallery. The sculptor aims to create hopeful, celebratory images, but uses an ersatz visual vocabulary of stylised figures, which reflect the inanity and false unity of the shopping centres and business parks for which they are commissioned. A more sensitive approach to public space was indicated in other projects that were shown here on in small colour photographs. The third sculptor, Charles Hadcock has a different interest in the universal through geometry. A large installation hung in three parts, comprised of thirty four, fifty five and eighty nine units respectively (numbers from the Fibonacci sequence), each unit consisting of a square of polished steel. A quiet hum emitted from speakers inserted behind the metal surface, and gave a sense of imminent drama, which never arrived. This matched the visual tension of the piece, particularly when viewed from behind. Northern Sculptors drew on a range of approaches to suit a wide audience, but by giving each artist a discrete space the exhibition showed a sensitivity to their differences rather than forcing similarities.